Marking their 4th birthday in style this weekend, Hoodoo invite Irish techno DJ Sunil Sharpe and English duo Blackhall & Bookless to join in on the celebrations. Sharpe arrives with a stellar reputation, owing in part to a legendary London Boiler Room set (one of three Boiler Rooms he has played), and also in part due to his vast musical knowledge and vinyl-based sets. This is one of a pair of Chinese gigs for Sharpe, with the other taking place in Shanghai. This Friday's show is a major get for brilliant techno promotors Hoodoo. Fri Nov 9, 10pm; RMB70 presale, RMB90 at the door. Oil Club. See event listing. Tickets. Winner of Rap of China, GAI, arrives in Shenzhen to partake in the aptly titled Trendy Music Festival. Bringing together a bunch of hip-hop artists from around the country, this festival will shed a light on the prevailing trends and talents that populate that particular music scene today. Sat Nov 10, 6pm; RMB149-599. Splendid China Folk Village. See event listing. Tickets. Having teamed up with famed producer and musical journeyman, Mark Reeder, last year to make their fantastic self-titled EP, Chengdu six-piece rockers, Stolen, came back with a bang this year, following up that slick record with another equally awesome piece of work, Fragment. Fragment is a mesmerising electronic piece that combines funk and sci-fi, showing a band at the top of their game. Sat Nov 10, 8.30pm; RMB100 presale, RMB150 at the door. B10 Live. See event listing. Tickets. British dubstep and bass pioneer Loefah arrives in Oil this weekend. Having built his reputation as a dubstep wonder, Loefah later moved away from the format and founded his own bass label, Swamp 81. His music makes use of disparate vocal samples, chunky bass lines and dense atmospherics, creating a stunning visual sound with his storytelling manner. Sat Nov 10, 10pm; RMB80 presale, RMB100 at the door. Oil Club. See event listing. Tickets. For more things to do in Shenzhen, check out our Events Section. For more Shenzhen event guides, get them sent directly to your phone (along with restaurant reviews, giveaways and other goodies) by adding ThatsShenzhen on WeChat, liking us on Facebook or subscribing to our weekly newsletter. 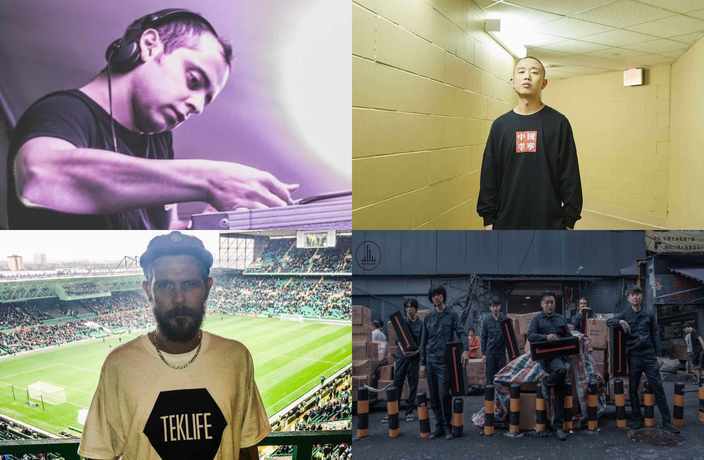 The hottest, hippest live music events happening this weekend in Shenzhen!